Persistent fetal vasculature (PFV), previously called persistent hyperplastic primary vitreous (PHPV), is a congenital defect that results when the fetal hyaloid vasculature fails to regress. The condition is almost always unilateral and associated with microphthalmia. Variable degrees of vascular remnants may remain, ranging from an isolated retrolenticular membrane to a complete stalk connecting the optic nerve to the lens as in this case. Other associated findings can include enlongated ciliary processes, prominent radial vessels or neovascularization on the iris surface, shallow anterior chamber with narrow-angle glaucoma, vitreous hemorrhage, and retinal detachment. 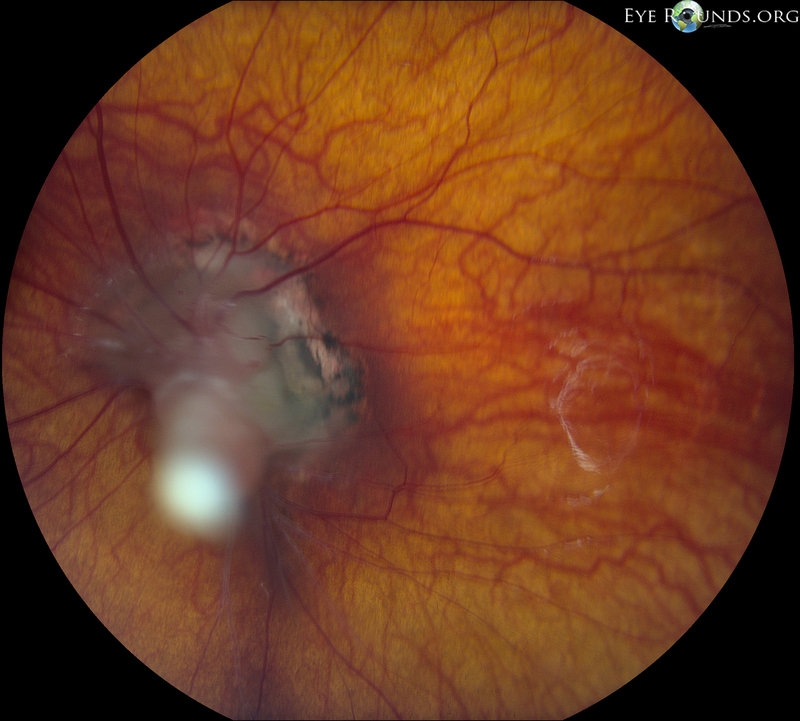 In this photograph, a stalk can be seen emanating from the optic disc into the vitreous with tenting of the surrounding retina and dragging of the macula. The associated cataract has been removed surgically.